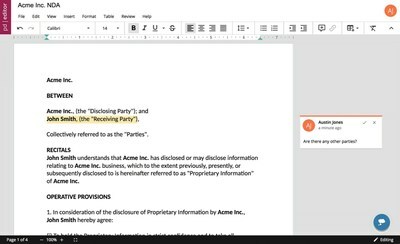 TAMPA, Fla., Oct. 4, 2018 /PRNewswire/ -- On October 2, 2018, Accusoft released a new addition to the PrizmDoc product family, PrizmDoc Editor. Built to help developers ensure their clients have secure editing and collaboration capabilities, PrizmDoc Editor will enhance the functionality of applications. This powerful web-enabled document editor simplifies the editing process. Users can say goodbye to the hassles and confusion of downloading attachments, editing, collaborating through email threads, and losing track of the final version. With PrizmDoc Editor, users maintain document security. The user will be able to track changes, make comments, and collaborate directly inside the developer's application. In addition to working in tandem with teammates, PrizmDoc Editor enables a secure collaboration on documents with external clients as well as colleagues at different companies. "We are proud to continue our tradition of building SDKs and APIs designed to shorten development cycles by providing code that is easy for developers to integrate into an application. PrizmDoc Editor is another easy-to-integrate tool that not only answers our ustomers' requests for secure document editing but also saves them valuable development time," says Jack Berlin, CEO of Accusoft. Compatible with any platform or language, PrizmDoc Editor can integrate into a variety of CRM, CMS, and project management platforms. Key prominent features include font substitution, commenting, table support, hyperlink support, and spell check. "Electronic document management systems can provide document security, but that isn't always the best way to ensure your information stays safe. For example, when a document is downloaded, distribution can no longer be controlled," said Mark Fears, PrizmDoc Product Manager. "PrizmDoc Editor provides in-browser document editing, ensuring that content never leaves the system while users collaborate." PrizmDoc Editor also has deployment options to suit your needs including Cloud or Self-Hosted. For a full description of all PrizmDoc Editor functionalities, please visit the overview page. About Accusoft: Accusoft offers a robust portfolio of document and imaging tools for developers. Our APIs and software development toolkits are built using patented technology, providing high-performance document viewing, advanced search, image compression, conversion, barcode recognition, OCR, and other image processing tools for use in application and web development. Visit www.accusoft.com for more information.